The article critically examines the European Commission’s conceptualisation of the rule of law in enlargement. Three main arguments are advanced. First, regarding the Commission’s understanding of the rule of law in the pre-accession process, it will be argued that it predominantly concentrates on legal-institutional reform. 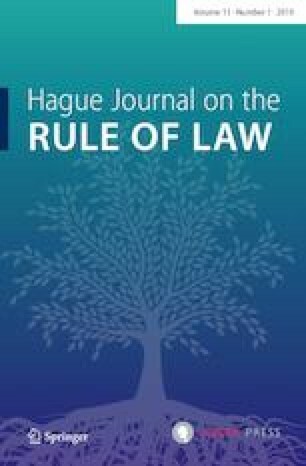 The article asserts that, although important, this particular focus fails to recognise that the rule of law is not only about the functioning of the (broader) legal sector, and the application and enforcement of law per se, but also about formal rule of law elements related to the quality of laws and regulations, as well as about societal orientation towards the rule of law and the will to respect it. Secondly, it will be argued that the EU’s pre-accession process does not sufficiently address the rule of law’s core formal elements, to the extent that its main focus is alignment with the acquis and changes made to domestic legislation are measured in terms of quantity and not quality. Thirdly, although the recent enlargement strategies and monitoring reports increasingly acknowledge the importance of societal transformation needed for the rule of law to take root in the applicant states, it will be demonstrated that this soft rule of law element has not (yet) been incorporated in the Commission’s understanding of and approach towards the rule of law.